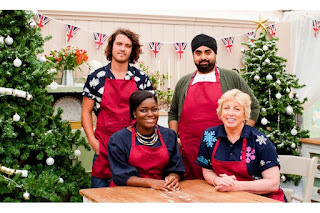 Like a standard episode, the competition consists of three rounds: a signature challenge where the contestants must execute their spin on a specific assigned baked good, a technical challenge where they each attempt to follow a bare-bones recipe they’ve never seen before, and a showstopper, which must be technically and visually impressive, as well as taste good. 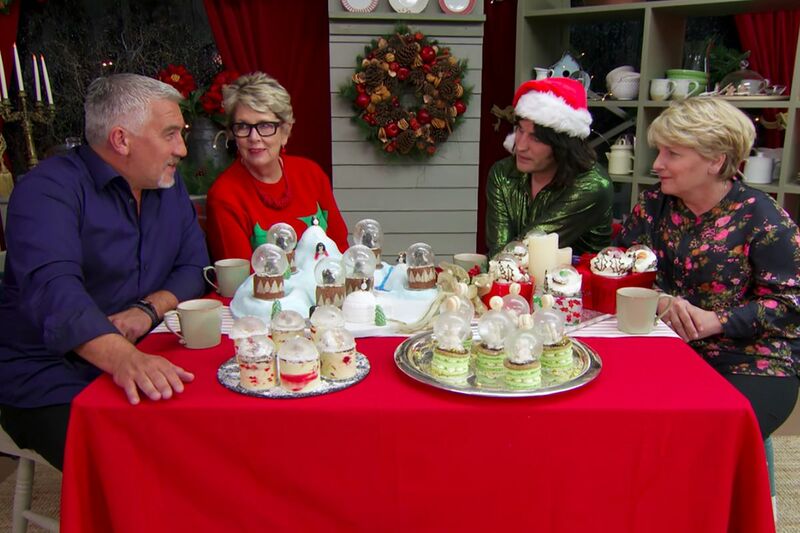 All the challenges in these episodes were holiday-themed, including mince pies, Yule log cakes, “ice fantasy” cakes, and small snow-globe cakes complete with sugar domes. There was even a bit of history about some of the baked goods and their traditional roots. The only awkward thing about these episodes was the fiction that they take place during the holidays. The show is filmed in a big tent in the garden/grounds of a large building. In the normal season, there are shots of local wildlife and sheep and such in between baking, and those are replaced here with shots of holly and evergreen trees. But no matter how much soft focus, cheerful sweaters, and fancy camera angles are used, you can’t actually hide that these were filmed in summer. The funniest moment was near the end of the first episode of these two. 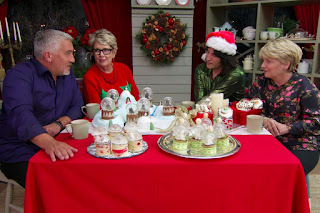 They had finished presenting the fancy snow-globe cakes (and they were very impressive), and it was pouring outside. You could hear it in the audio and see water streaming down the windows on the sides of the tent. Then the contestants “went outside” for a Christmas concert with their friends to celebrate. Suddenly it was not raining. In fact, the whole clearing was full of fake snow. Despite the awkwardness of that act, these episodes were a lot of fun, and I’m sure all the other holiday specials are as well.